Casino Parties have never been more popular and A Special Event is your one-stop source for everything you need! Plus all of the standard party items you’ll want to make your event especially memorable. We have a large choice of rental tents, linens, furniture and equipment for every time of occasion. 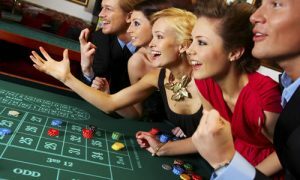 If you have a non-profit organization, social group, corporate event, fraternity party or social gathering coming up and are looking for the perfect theme, our turn-key Casino Party services are perfect.! For Casino Parties in Raleigh, Durham, Cary, Chapel Hill, Apex, Wake Forest, Garner, Fuquay-Varina, Zebulon, North Raleigh, Morrisville, Holly Springs, Clayton, Sanford, Southern Pines, Lillington or Fayetteville, A Special Event is here to help! Let us assist you every step of the way and make your event a truly lucky one. If you’d like guidance on how to put on a great event, please call 919-557-9696 or Contact Us by email. Or Request An Estimate here on the website and we’ll be in touch to help get you started.